"Trusted by thousands of teams across 80 countries, Taskworld allows you to finish work on time, communicate seamlessly and get real time performance insights. " 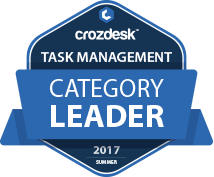 Taskworld scored 86/100 in the Task Management category. This is based on user satisfaction (82/100), press buzz (43/100), recent user trends (rising), and other relevant information on Taskworld gathered from around the web. Taskworld is a software service and collaboration platform designed for companies of varying sizes. It has been simplified and streamlined to help facilitate task management, collaboration, task delegation and team communication. Taskworld aims to assist its users in setting their work schedules and goals. It also acts as a knowledge management tool to measure progress and performance, which is useful for evaluating and assessing methods and plans of the company. Taskworld is a project and task management system that focuses on outlining assignments for all members of the team within an organization. 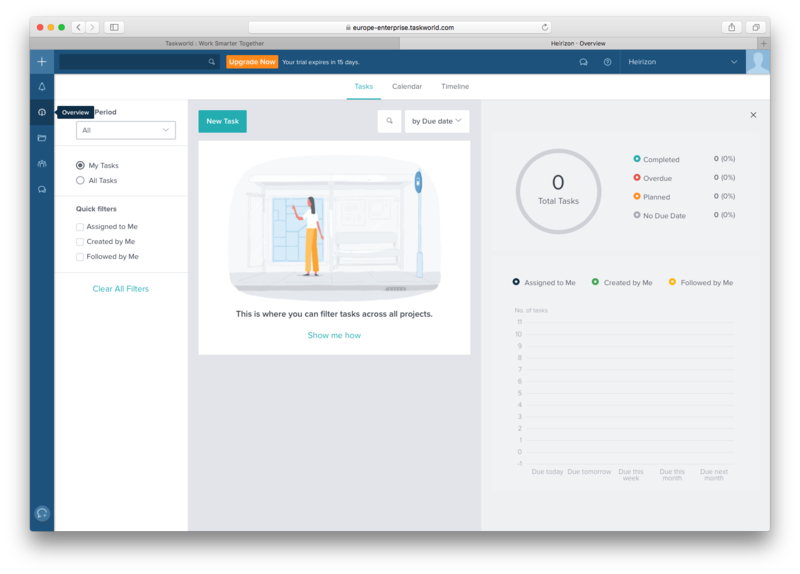 A core feature built in the platform is the ability for users to manage, organize projects, and issue tasks for teams of all sizes. It also has enterprise messaging capabilities as well as an overview and analytics function to summarize and convert the output into intelligent—but easy to understand—data. All of this is saved via its private servers. Alternately, users can choose to use an external cloud storage option. With this type of automation and a streamlined process, it helps teams to focus on the projects and less on administration. What are the features of Taskworld? The defining theme that belies Taskworld’s biggest asset is its ability to manage and delegate tasks. It has a multi-tier system of management to help users keep track of project groups, projects, and checklists. This makes a proper and clear division of labor for the teams possible. It also has several basic project and task management functions such as assigning roles, setting due dates, dividing tasks into multiple locations, managing project templates, copying projects, and to optimizing the Kanban boards. With this, users manage workflow and preferences to cut the time needed to navigate through the tasks and the timeline by having all of the data organized into one dashboard, which will be discussed in the next point. Part of Taskworld’s features is a specialized overview for all projects and tasks. This dashboard can be filtered by status, dates and designated assignees. The task-based calendar program also has an analytics system, which features a heads-up dashboard to display the tasks along with updates and information for upcoming due dates for projects. It also features project analytics, burndown and burnup charts aimed at helping users analyze the data of all projects. This can help provide insight for users who need to consider efficiency when making future business decisions for the company. Another feature users will find helpful is Taskworld’s is the collaborative nature of the platform. The service allows the user to create cyclical tasks, which can make recurring projects easier to manage. Supervisors are given the ability to set a priority level of each task in order to help their team members identify which jobs to work on first. They can also identify the task dependencies and connections with other pending tasks throughout the project timeline. Users can also comment, suggest ideas or read more on how the project is progressing via the commenting feature. This suite is useful in the way as it encourages other members of the team to engage in the progress and development of tasks and projects. Taskworld also comes with a chat feature set for either public channels for the entire company to see, or individual channels for private chats. The chat allows you to message with your coworkers, upload important or sensitive data, redirect messages to e-mail addresses and receive notifications for important updates regarding the project or the company itself. What are the benefits of Taskworld? The key impression users will have about Taskworld is its simplified software coupled with the depth of features that can make the way teams work more efficiently. 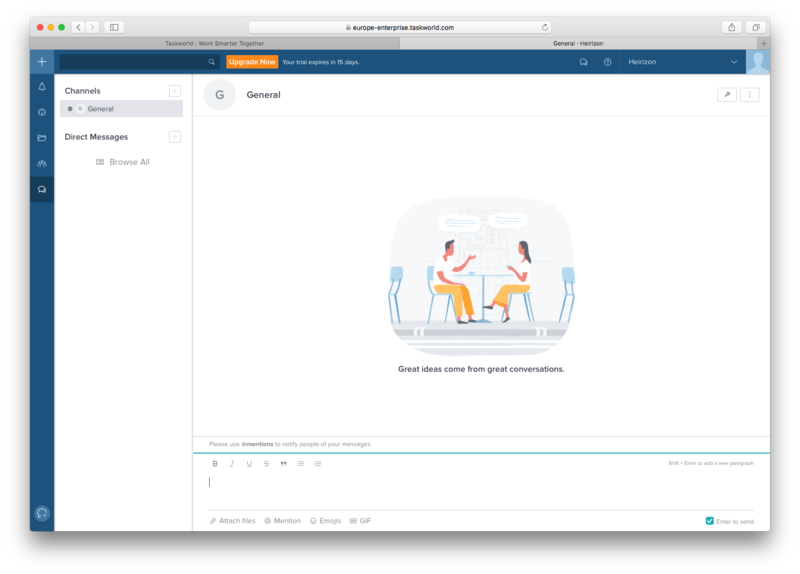 Despite its basic look and feel, it has a large variety of features available, such as a dashboard for keeping an eye on ongoing projects and a chat feature that lets users communicate with each other with ease. It is also user-friendly, meaning employees can quickly learn how to use the program, and work on successfully completing tasks without sacrificing too much time or effort in understanding the systems in place. Another benefit of Taskworld is it has an easy-to-learn platform which encourages engagement from others in the workspace. Taskworld significantly cuts down the delays in project completion due to features such as the task commenting and messaging through secure channels to reaching co-workers. Unlimited tasks and projects – This is vital in maintaining and completing work throughout the year without having to worry about neglecting other tasks that may be connected to other projects. Multiple assignees – A common issue found in work is when one member of an organization is prioritized as the representative for one task. Sometimes, some project management systems have a hard time identifying the lead member in a task with multiple assignees. Taskworld works around this by giving users the option to assign several people for the same task, with specific roles. This can help in simplifying the way the task can progress, without isolating specific members of the team. Public/private channels – As mentioned previously, this allows messages to be distributed either company-wide, within a specific group or one-on-one. This feature can help with information dissemination, ensuring work proceeds smoothly throughout the project. Project chat and timeline – This feature can help people keep track of the progress and development of the same project while allowing people involved to communicate and coordinate ideas and suggestions. Employee database – Users can use this to keep track of their employees and their roles or positions within the company. It will help in choosing and assigning people with tasks relevant to their position and talents. Burndown/up charts – Taskworld can generate burnup and burndown charts, as mentioned previously. These can be instrumental in tracking the progress of project tasks and timeline completion—burndown charts track how much work has been finished, while burnup charts track how much work is left and how much work there is overall. 100GB storage – Taskworld knows just how much storage space projects can take up. This is why they provide all of their users with 100GB storage. Ever worry about the hassle of archiving information for a business? Don’t worry about the high-level costs of storage available as finished projects and products will be kept in a digital archive for future reference. It helps in maintaining contact with previous clients and executing tasks the company may need later on. SAML 2.0 Single Sign-On (SSO) – Users who are worried about their accounts getting hacked can rest easy with this feature. 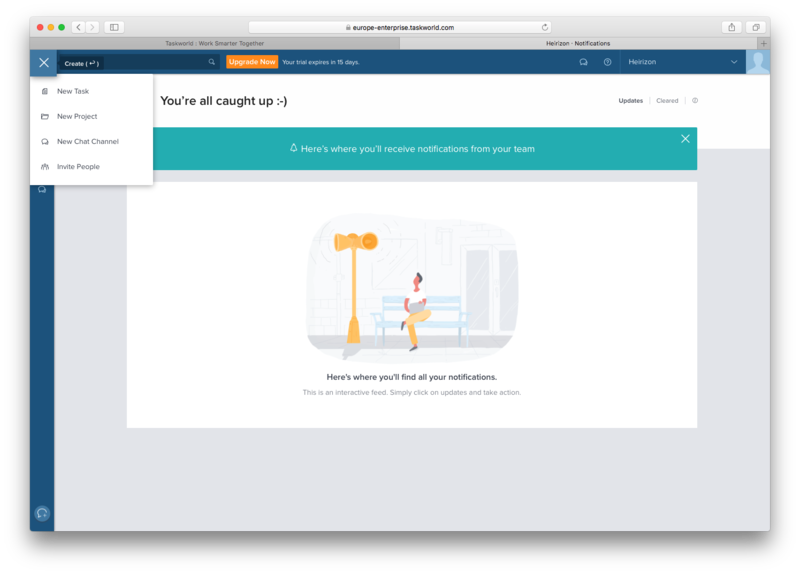 SSO lets users access their accounts in Taskworld via an authentication code unique to them to ensure their accounts are private and secure. Unlimited workspaces and cloud storage – this feature lets users create multiple workspaces in Taskworld. This is ideal for large-scale businesses with several branches or region-specific service areas. User audit reports and compliance export of all messages – users get to keep track of the professional conduct and attendance of their coworkers and employees. This helps in assuring members are efficient and effective at their designated roles. Full and continuous cross-regional backup of data – with a daily backup source, users are assured of the safety and protection of their data. This prevents issues such as data corruption or irretrievable files. With its slick design coupled with a wide array of features, Taskworld is a user-friendly task management software solution that users can easily learn to maximize. Companies ranging from small-scale startups to large enterprises can find equally efficient use of Taskworld, thanks to its many easy-to-learn features. Taskworld was submitted by Shiv Sharma from Taskworld Inc.
4.09/5 based on 71 user ratings. Project management for millennial managers. Better analytics and intuitive UI - very effective. I'm an User Experience Researcher and Designer working with and managing a team of 10 talented designers, developers, and researchers. Here's my take on Taskworld. There are a plethora of Project Management Softwares out there that boast of the number of features they have in their product. All packed and fully ready to be used - to ‘make our lives easier, better, etc.’. But let’s be honest to ourselves. The easy answer is 'I need to measure it'. The difficult part is finding what to measure. This is where Taskworld shines. It uses simple graphs and analytics that speaks to the manager. I need to check how an ongoing Project is doing - check the Burn-up. That’s just the tip of the iceberg as to what Taskworld is capable of. It’s Kanban (column) drag and drop user interaction is one of the smoothest experiences I have ever had. But that’s just visceral. The answer to 'what’s in it for me?' becomes vivid when you start planning your projects in Taskworld. The app has somehow managed to appeal to both the Planner/Organisers and the Team-members/Finishers of the world. As an Organiser and Planner, I get to see progress and analytics of all my projects. This helps in identifying the bottlenecks, gaps, slippage, etc. of my projects. Dragging around things and organising them is easy and the app feels fresh. If you a control-freak like me, you can put the projects in Restricted mode! As a Finisher, you are always concerned about efficiency, time, productivity and enjoy visualizing your own performance - quantified self. Taskworld knows this and cuts through all the clutter and presents just the right information to Finishers on the Overview page. That’s where you know what needs to be done right away and what can be deferred. They do not have time for petty issues of one project or one task etc. What appeals to them is how things are from their vantage point, i.e. the entire product. Overview comes to the rescue and shows what’s the status of the entire product by combining all the relevant projects. They have a nice graph that shows the Completed, Overdue, and planned percentages. I can also find out my on-time completion rate and try to improve it over time. Last I checked, the company was backed by serial entrepreneur billionaire Fred Mouawad and has grander plans of making Enterprise Project Management hassle-free for everyone out there. Lastly, thank you Taskworld for making my and my team’s life easier and stress-free. Our velocity has nearly doubled since we started measuring ourselves using your software. The accountability has increased, the requirements slippage has gone down to near zero, and with your feedback system my team feels appreciated for all the hard work they put in. Good luck and keep innovating in the PM sphere. - I feel that the app is going to be perceived as a tad too complicated/complex for the average Joe or single users. - Taskworld is adding some great features that somehow clutters the UI. I hope they will improve on it soon. Anyone else out there using Taskworld? Feel free to chime in.